While passing through the lovely state of Iowa, I payed a visit to the DeSoto NWR. It is located about 5 miles off US 29 near the small town of Missouri Valley IA. The refuge is in Iowa and Nebraska. A sign on the refuge auto tour lets you know when you cross the border. The visitor center is new and has many informative displays about the geological, natural, and cultural history of the area. This refuge has a wonderful blend of tall grass prairie and woodland. The refuge includes a large lake and is partly bordered by the Missouri River. I would love to return to this refuge in the spring or fall months and spend more time. How do they fly in two directions without running into each other? Land and cattle. Land and cattle. As far as I could see in any direction. After a 7 hour drive that took me through one town of any size, I pulled into the tiny town of Medora ND on the 19th of July. Medora is now a tourist attraction with many hotels and restaurants. It serves as the gateway to the South Unit of the Theodore Roosevelt NP. One of the reasons the NP was named after the 26th president of the United States is because “Old Four Eyes” as he was known around here, owned two ranches in the area and came to love the land in North Dakota. There are all kinds of stories about the young Roosevelt during his time here. One common theme to the stories is that he really loved this land. Medora was named for the wife of its founder, a 24 year old French nobleman the Marquis de Mores. You can take a tour of the Chateau he built for his bride. The town sits on the banks of the Little Missouri River. You can also visit the North Dakota Cowboy Hall of Fame. I don’t know much about cowboys or rodeo, but I thought I would check it out. I did see a lot of rodeo memorabilia that didn’t mean much to me. Apparently North Dakota has turned out quite a few National Rodeo Champions over the years. YIPEE!!!! There are not only rodeo stars that have been inducted into the hall of fame. One of the categories of inductees is ranchers before 1940. One of the latest inductees in this category is Lettie L Ulhman. She built a 10,000 acre ranch during the depression. You can find a photo of her in the following images. The South Unit of the Theodore Roosevelt NP contains the “Badlands of North Dakota”. Like the Badlands in South Dakota I found the topography amazing and beautiful. Another thing this little town is known for is its musical that is performed every night from spring through fall. It is a western themed night of entertainment. I found the performers to be very talented. They come from all over the country. There was even a young man from New York City. I don’t know how he got in there. This is the set before the entertainment began. Notice the elk on the hill behind the set. I arrived at the entrance to the auto tour at the West end of the 1.1 million acre Charles M Russell National Wildlife Refuge at about 6:00 AM. The auto tour is a 20 mile gravel/dirt road that covers the environment, geology, and wildlife at several elevations in the refuge. Of course with a refuge this large (second largest in the lower 48 states) a 20 mile road only covers a small portion of the refuge. While the refuge boasts several species of mammals and birds I didn’t find all that much going on. Maybe it was in part due to the thunder storm we had the night before. In fact I reached a section of the road at the bottom of a large, steep dirt wall that was covered with water and mud and I wasn’t sure if I should continue. About that time a man driving a road grading machine came along. So far he was the only other human I had seen. I inquired as to the depth of water on the road. He looked at me and my truck and told me to just put it in four-wheel-drive and I should make it through OK and that this was the worst section of storm damage. He said he would watch till I got to the other side of the flooded area. So there I went creating quite a wake as I plowed through the water and mud. When I emerged on the other side my truck had so much mud and small rocks stuck to the wheel wells I’m surprised the wheels would even turn, but there I was, safe and sound. I waved to the driver and off I went. I had read that there was only one bathroom on the auto tour and after the 24 ounces of coffee I had on the way to the refuge I was hoping to find it sooner than later. A few miles down the road I came on an area that allowed overnight camping. It was flooded and no one was around, but there was the outhouse. OK - it was wade through several inches of water or – well as far as I was concerned there was no or. I wasn’t about to take my shoes off. I had no idea what might be under that very murky water. I parked the truck as close to the privy as possible and stepped out. The water covered the top of my shoes until I reached the concrete landing. At that point it was only about an inch deep. I opened the door and found a remarkably clean and barely damp pit toilet. It was quite typical of Federal recreation area toilets. So I did my business and waded back to the truck. I spent the next several hours with wet feet. Luckily it was a very warm day. This area is known for its elk population, but I found no elk. It is also known for its Sage and Sharp-tailed Grouse. I found no Grouse. I did find some very lovely scenery and a few birds. Because I spent the first 22 years of my life near the confluence of two of Americas great rivers, the Missouri and the Mississippi, I decided during my journeys across these United States that I would visit the headwaters of both rivers. Last year I visited Itasca SP in Minnesota where a small stream eventually becomes the mighty Mississippi. You can check back to August of 2012 in the blog for that story. Yesterday I visited the Missouri River Headwaters SP in Montana. The Headwaters state park marks where the Madison, Jefferson, and Gallatin Rivers come together to form the Missouri River. The area surrounding this confluence of rivers is rich in history. The Native Americans came to hunt bison, trade goods, camp by the river, fish for trout, and pick berries. The rivers, plants, rocks and wildlife provided the necessities of life: food, medicine, tools, clothing, and shelter. On July 25th 1805 Captain Clark became the first recorded non-Indian to reach this area. The history books are full of the adventures of Lewis and Clark and all those who came behind them. Needless to say the young United States of America was about to make a great expansion and the Native People would pay an enormous price. It’s hard to share this adventure because most of it was a very personal and emotional experience. I’ve included a few images of the information signs scattered about the park and of course I found a few wild critters that were willing to pose for my camera. The confluence of the Jefferson and Madison Rivers. The Gallatin comes in about a mile downstream. How the river got its name. I did not know this. Shame on me. If you click on the image it should enlarge on your screen. As I stood there I could almost hear the music and the stomping of boots on the hardwood floors. Went into the town of Three Forks and found this sign. Hey Sarah, is that Pierre Menard any relation? I arrived at Madison Arm Resort on Lake Hebgen in the Gallatin National Forest MT on July 10. I met with four other members of the AGB and one other FreeWheeler. We had a lovely dinner together and the next morning said goodbye to Jane who was on her way to Cody WY and then to Canada. You go girl. 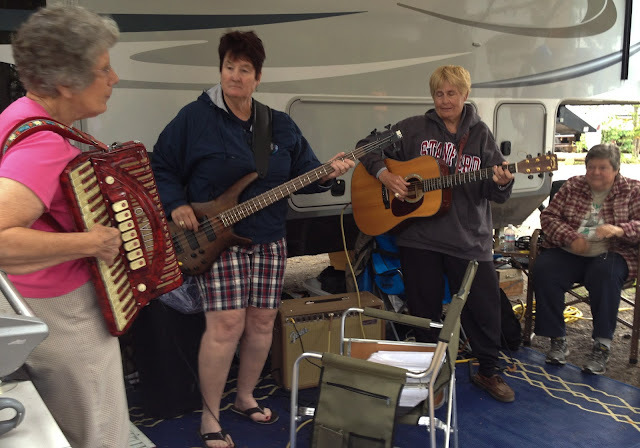 Laura, Robin, Marie, and I held a mini concert for some of the folks in the campground. They seem to appreciate our little group and it was good practice for us. Our sound person Kathy was there to give us moral support. I don’t know about the others, but I needed that. The next day I was off on the one day I had set aside to explore Yellowstone NP. The park was only a few minutes from the campground. Of course it is a HUGE park and one day is hardly enough to see it. I had been to Yellowstone in 1989 so I skipped the geothermal areas and places where I thought the crowds would be. I went on a couple of back roads in the park that I had missed during my first visit. I was in search of wildlife and was disappointed that I didn’t see Moose, Bear, or Wolves, but I did manage to find some Bison and Elk and some beautiful scenery.